CORVALLIS, Ore. – Some of the clearest, most comprehensive images of the top several miles of the Earth's crust have helped scientists solve the mystery of why Mount St. Helens is located outside the main line of the Cascade Arc of volcanoes. A giant subsurface rock formation some 20-30 miles in diameter, known as the Spirit Lake batholith, appears to have diverted magma and partially melted rock outside of the arc and to the west, forming the region's most active volcano. Results of the study, which was supported by the National Science Foundation and carried out in collaboration with the U.S. Geological Survey, are being published this week in Nature Geoscience. Previous imaging studies have primarily utilized seismic methods. During natural earthquakes and artificially induced tremors – by setting off explosions – scientists can image some of the properties of subsurface rocks by tracking the sound waves. This method provides clues to the structure, density and temperature of the rocks. More recently, researchers are using "magnetotelluric," or MT data, which measures the Earth's subsurface electrical conductivity. Variations in the geomagnetic and geoelectric fields can reveal much about the subsurface structure and temperature, as well as the presence of fluids such as magma. "Either method by itself can lead to a level of uncertainty, but when you layer them together as we have done in this project you get a much clearer picture of what lies below," said Adam Schultz, an Oregon State University geophysicist who is principal investigator on the NSF grant to OSU and co-author on the Nature Geoscience paper. "The longer you run the measurements, the crisper the images and the deeper you can 'see' the subsurface. We were focusing on the upper 12-15 kilometers of the crust, but with a longer experiment we could see 200 to 300 kilometers below the surface." Understanding the formation of Mount St. Helens begins with plate tectonics. Similar to the present day, where the Juan de Fuca plate is being subducted beneath North America, in the past crustal blocks with marine sediments were "slammed into the continent, where they accreted," Schultz said. "This material is more permeable than surrounding rock and allows the magma to move through it," he noted. "The big batholith acts kind of like a plug in the crust and diverted magma that normally would have erupted in line with the other major Cascade volcanoes, resulting in St. Helens forming to the west of the Cascadia Arc, and Mt. Adams slightly to the east." Mount St. Helens experienced a major eruption in May of 1980 and since has gone through periods of dome-building (2004-08) and dormancy. A study in 2006 by researchers from the University of Canterbury in New Zealand provided some images of the volcano's subsurface. During the next year, Schultz and the author of the 2006 study will use magnetotelluric technology to gather new and hopefully crisper images to see how much has changed since that study. 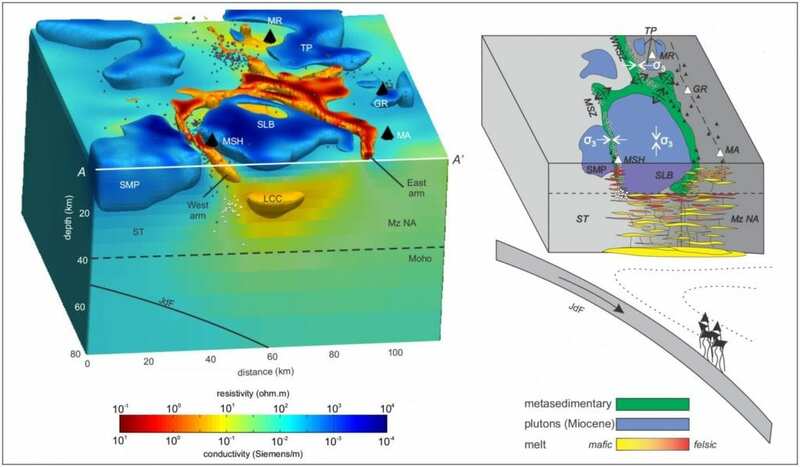 Schultz said that the images from the latest study are clear enough that by continuously monitoring the geoelectric and geomagnetic fields, they may be able to detect changes in the movement of magma beneath Mount St. Helens, and perhaps other volcanoes. Schultz is in OSU's College of Earth, Ocean, and Atmospheric Sciences.